So...I have to tell on myself! 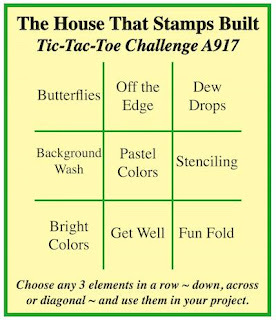 I had my card totally finished, and when I began to type up the blog post, I inserted the Tic Tac Toe grid and said OOPS! I had worked from memory instead of re-checking the grid, and had used bright colors instead of pastel colors! So......this one's a total 'do-over'!!! Silly me...sheesh! I'm sure that at least one of you is in the process of laughing at with me, because you've done the same silly type of thing, right??? 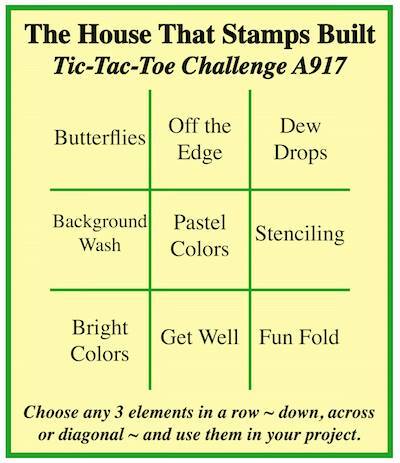 Very pretty - hate that you had such a struggle with this challenge - but you created a beautiful get well card. What a fabulous get well card Patti! Been there, done that, now you have an anything goes card ready to go for next month! LOL!! I think we have all done that! I loveeeeeeee this! Just BEAUTIFUL!!!!!!! Very pretty and perfect get well card. The struggle is frustrating, but the outcome is beautiful. The Do-Over is gorgeous! Great layout! The do over is gorgeous and I bet the first version was as well. OH, I'm totally with you!! If you read my post, you know something similar happened to me on this challenge, too! Such a pretty card; love the soft colors. Love this! That blue is my favorite! So calming. Very pretty card. The colours are lovely. I love the layout too. Have a great day my friend. Oh, Patti, I do silly things day in and day out! Just wish the final outcomes of my "do-overs" were as pretty as yours. Love your card today. HA! yep we all do it! But, I love the color combo you used and the pretty flowers offset! Very pretty card, Patti, would make anyone feel better.